South Africa's foreign minister has called an urgent meeting with ambassadors following attacks against foreigners in Durban. A week ago, three people died amid protests targeting shops, many of which are foreign-owned. Around 50 people sought shelter at a police station when a group of unemployed South Africans forced them out of their homes in the night. Foreigners are targeted by people who accuse them of taking jobs from locals. About 100 people attacked small food shops on Sunday night and into Monday morning, looting and burning the buildings. One woman died when she fell through a roof while she was running away from protesters. Another two people died from gunshot wounds, allegedly inflicted by a shopkeeper. Last Tuesday foreigners started seeking shelter in a mosque and a police station. 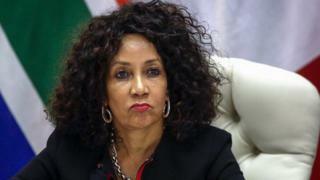 The minister of international relations and co-operation, Lindiwe Sisulu, urged the police to act against people targeting foreigners. "All criminal activities and looting of properties of foreign nationals will not be tolerated‚ and the police and other law-enforcement agencies must act without fear or favour," she said in a statement. She has organised a meeting with African diplomats on Monday. Some people complain about foreigners working in South Africa where unemployment is painfully high - standing at more than 27% at the end of last year. Xenophobia against migrants from other African countries is not new in South Africa. In 2015 unrest in the cities of Johannesburg and Durban claimed seven lives as immigrants were hunted down and attacked by gangs. South Africa experienced its worst outbreak of violence against foreigners in 2008, when more than 60 people died.